The Chinese Communist Revolution or the Chinese revolution of 1949 was a revolution in China that was led by the Communist Party of China and Mao Zedong which resulted in the proclamation of the People's Republic of China on 1 October 1949. It started in 1946, after the end of the Second Sino-Japanese War, and was the second part of the Chinese Civil War. In the Chinese media, this period is known as the War of Liberation (simplified Chinese: 解放战争; traditional Chinese: 解放戰爭; pinyin: Jiěfàng Zhànzhēng). The historical development of China resulted in sharp contradictions in society. Under the Qing dynasty, high rates of rent, usury and taxes concentrated wealth into the hands of a tiny minority of village chiefs and landlords. According to one statistic, "Ten percent of the agricultural population of China possessed as much as two-thirds of the land." Simultaneously, China was under heavy colonialist pressure by the Western powers and the Japanese (the Century of Humiliation), as exemplified by the Opium Wars, the unequal treaties or the Boxer Rebellion. This extreme internal inequality and external aggression led to a national and class consciousness among vast swaths of the population. Owing to these reasons and decline of the Qing state, a peasant revolt led to the Xinhai Revolution which ended 2,000 years of imperial rule and marked the beginning of China's early republican era. However, the resulting nationalist revolutionary regime was unable to form a stable national government and carry out land reforms. Its main leader, Sun Yat-sen, bowed down and was forced to seek asylum in Japan. Following the end of World War I and October Revolution in Russia, labor struggles intensified in China. Workers were fighting for better wages, freedom of association, freedom of speech, and better welfare. In Shanghai alone, there were over 450 strikes between 1919 and 1923. Although China joined the Allies by declaring war on Germany, the nation suffered humiliation from Japan at the Treaty of Versailles, which led to the May Fourth Movement, a series of massive student protests in China. The May Fourth Movement twenty years ago marked a new stage in China's bourgeois-democratic revolution against imperialism and feudalism. The cultural reform movement which grew out of the May Fourth Movement was only one of the manifestations of this revolution. With the growth and development of new social forces in that period, a powerful camp made its appearance in the bourgeois-democratic revolution, a camp consisting of the working class, the student masses and the new national bourgeoisie. Around the time of the May Fourth Movement, hundreds of thousands of students courageously took their place in the van. In these respects the May Fourth Movement went a step beyond the Revolution of 1911. The Communist Party of China was founded in 1921. After a period of slow growth and alliance with the Kuomintang (Chinese Nationalist Party), the alliance broke down and the Communists fell victim in 1927 to a purge carried out by the Kuomintang under the leadership of Chiang Kai-shek. After 1927, the Communists retreated to the countryside and built up local bases throughout the country and continued to hold them until the Long March. During the Japanese invasion and occupation, the Communists built more secret bases in the Japanese occupied zones and relied on them as headquarters. The Nationalists had an advantage in both troops and weapons, controlled a much larger territory and population, and enjoyed broad international support. The Communists were well established in the north and northwest. The best-trained Nationalist troops had been killed in early battles against the better equipped Japanese Army and in Burma, while the Communists had suffered less severe losses. The Soviet Union, though distrustful, provided aid to the Communists, and the United States assisted the Nationalists with hundreds of millions of dollars' worth of military supplies, as well as airlifting Nationalist troops from central China to Manchuria, an area Chiang Kai-shek saw as strategically vital to retake. Chiang determined to confront the PLA in Manchuria and committed his troops in one decisive battle in the autumn of 1948. The strength of Nationalist troops in July 1946 was 4.3 million, of which 2.2 million were well-trained and ready for country-wide mobile combat. However, the battle resulted in a decisive Communist victory and the Nationalists were never able to recover from it. On October 1, 1949, Mao Zedong proclaimed the founding of the People's Republic of China. 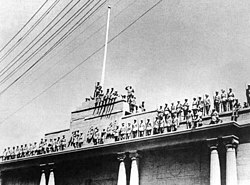 Chiang Kai-shek, 600,000 Nationalist troops, and about two million Nationalist-sympathizer refugees retreated to the island of Taiwan. After that, resistance to the Communists on the mainland was substantial but scattered, such as in the far south. An attempt to take the Nationalist-controlled island of Kinmen was thwarted in the Battle of Kuningtou. In December 1949 Chiang proclaimed Taipei, Taiwan the temporary capital of the Republic, and continued to assert his government as the sole legitimate authority of all China, while the PRC government continued to call for the unification of all China. The last direct fighting between Nationalist and Communist forces ended with the Communist capture of Hainan Island in May 1950, though shelling and guerrilla raids continued for a number of years. In June 1950, the outbreak of the Korean War led the American government to place the United States Seventh Fleet in the Taiwan Strait to prevent either side from attacking the other. ^ Lynch, Michael (2010). The Chinese Civil War 1945–49. Osprey Publishing. p. 91. ISBN 978-1-84176-671-3. ^ a b Roberts, John Peter (2016-01-21). China: From Permanent Revolution to Counter-Revolution. Wellred. ISBN 9781900007634. Ten percent of the agricultural population of China possessed as much as two-thirds of the land. In the province of Shansi, 0.3% of the families possessed one quarter of the land. In Chekiang, 3.3% of the families possessed half the land, while 77% of the poor peasants possessed no more than 20% of the land. ^ Dirlik, Arif (1989). The Origins of Chinese Communism. Oxford University Press. ISBN 9780195054545. ^ Chan, John. "The tragedy of the 1925-1927 Chinese Revolution". www.wsws.org. Retrieved 2018-12-13. ^ "World Policy Journal - Summer 2005". World Policy. Retrieved 2018-12-10. ^ Hunt, Michael H. (2015). The World Transformed 1945 to the present. Oxford University Press. p. 113. ISBN 978-0-19-937102-0. ^ Patrick Fuliang Shan, “Local Revolution, Grassroots Mobilization and Wartime Power Shift to the Rise of Communism,” in Xiaobing Li (ed. ), Evolution of Power: China’s Struggle, Survival, and Success, Lexington and Rowman & Littlefield, 2013, pp. 3-25. ^ 《中华民国国民政府军政职官人物志》 (in Chinese). p. 374. ^ 《国民革命与统一建设：20世纪初孙中山及国共人物的奋斗》 (in Chinese). p. 12. ^ 《国民革命与黃埔军校：纪念黃埔军校建校80周年学術论文集》 (in Chinese). p. 450. ^ "Army Department Teletype conference, ca. June 1950". Harry S. Truman Library and Museum. US Department of Defense. Retrieved 14 April 2015. Franke, Wolfgang, A Century of Chinese Revolution, 1851–1949 (Basil Blackwell, Oxford, 1970).